Italian MH Series 3/5 s/steel pressure pump with automatic controller 40 L/min @ 420 kPa. This is the MH series 3/5 all stainless steel water pressure pump suitable for domestic, commercial and industrial applications where clean water needs to be supplied at an even and stable pressure. This pump will supply 40 L/minute at 420 kPa which is enough for a two bathroom single or two level house or more. We couple the Italian made pump to a very reliable electronic controller with an adjustable turn on pressure point, the controller provides run-dry protection which means that if the water supply to the pump runs out, the controller will automatically turn off the pump and prevent damage to the pump. When you turn the tap on, the controller senses this and starts the pump, the pump remains on providing pressure until you turn the tap off and then the controller stops the pump, no more annoying pressure fluctuations. 1 1/4" female BSP inlet and 1" male BSP outlet on the controller. Click here for the full specifications. Italian MH Series 3/6 s/steel pressure pump with automatic controller 40 L/min @ 540 kPa. Italian MH Series 3/4 s/steel pressure pump with automatic controller 40 L/min @ 340 kPa. Italian MH Series 3/2 s/steel pressure pump with automatic controller 40 L/min @ 185 kPa. Italian MH Series 3/3 s/steel pressure pump with automatic controller 40 L/min @ 265 kPa. Jabsco 82600-0094 24V DC Marine Fresh Water pump 22.7 L/min max flow and 60 psi. 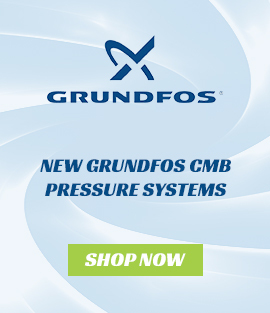 Grundfos/Dab Active Euroinox 40/80 Automatic Pressure Pump with s/steel pump and suction lift to 5m deep. 40 L/min @ 540 kPa to 100 L/min @ 290 kPa. Irrigation Warehouse Group Pty. Ltd.